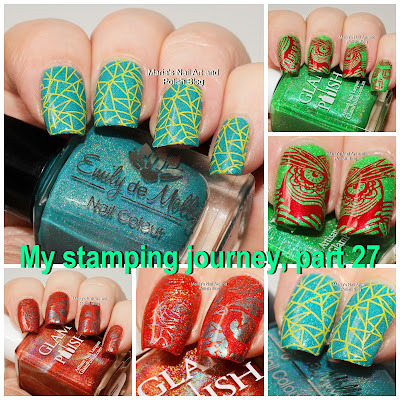 Today I have Take 109, 110 and 111 in my stamping journey for you! Take 109: The base is Glam Polish She’s Got The Power stamped with Hit The Bottle Drop Red Gorgeous, plate Bundle Monster Whoo Are You? BM-S315, stamper MoYou London XL Marshmallow Sticky. Take 110: The base is Glam Polish Hibiscus Hideaway stamped with the duochrome Jolifin Flip-flop Ocean, plate Moyra 06 Florality 1, stamper MoYou London XL Marshmallow Sticky. Note to myself: Subtle, but nice enough. Take 111: The base is Emily de Molly Reflection stamped with Dance Legend 6 Yellow Stamping Polish, plate Moyra 07 Labyrinth, stamper MoYou London XL Marshmallow Sticky. Note to myself: I like it a lot! Take 111, the last one of them, is my favorite - do you like any of these? Hard to pick, they all look great! I like them all and quite a lot, you know. That owl and geometric print are great. The last one is my pick; the first one is lovely too. The second - nice! Thank you so much, I'm so happy you like them!! And...another fabulous group!! Love those owl fingers & I'm impressed with that red that stayed red over a green!! Overall, yes 111 is the winner - love the colors and pattern you chose to combine. Yes, that red really is super great - Thank you so much for your kind words! LOL how fun, I didn't think of Christmas, but maybe you are right! Thanks a lot - that's also my favorite! They are pretty together, and it's a subtle mani - I'm glad you like it! Aww, thanks a lot Tanja! Yes, it is such an amazing plate, I love it! You are so sweet, thank you so very much!